The station wagon, once the popular choice for family hauling, faded into obscurity replaced by the minivan and now the huge popularity of the SUV. The reasons are varied, and guesses include styling, desire to drive at an eye level as if they were walking, lift-over height for cargo and child seats, improved fuel economy versus past choices, a comfortable ride, all-wheel drive, easier ingress/egress with our overly large population and more. But the wagon performs like a sedan. And Mercedes makes one that performs like a sports car. The second most powerful car in the Mercedes AMG lineup is the 603hp E63 S wagon. Even their track monster AMG GT R is rated at 577hp. The torque from the 4.0 liter twin turbo engine is rated at 627lb ft starting at 2500rpm only bested only by the S 63 sedan with 664lb ft. Probably due to a few lines of code. 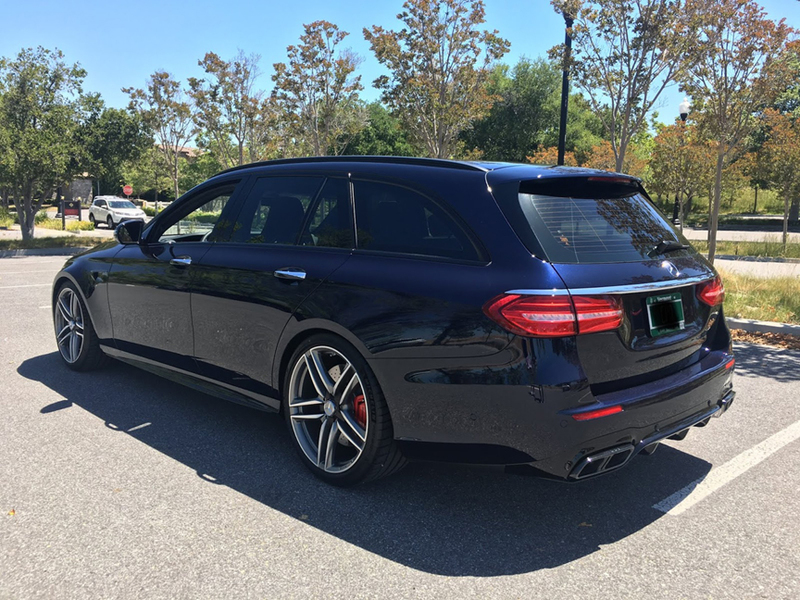 This sleek wagon also has the horizontal tail light styling of the coupes instead of the sloped triangles of the sedans. The transmission is the AMG Speedshift MCT 9-speed unit. It’s a multi-clutch transmission, using a clutch pack but no torque converter. It is not related to the dual clutch transmissions that have two output shafts instead of one. The advantage of this design is quick response and ability to handle higher torque loads. The dichotomy continues inside. Beautiful interior appointments, the large S-class worthy dual 12.3” LCD display screens that stretch from driver to mid-dash and then the superb sport seats looking wonderfully sculpted and serious, not quite out of place in an overall utility design. You don’t expect sports car seats in a wagon, and the contrast works perfectly. The all-wheel drive enables consistent launches, Car and Driver tested one with a 3.0 second 0-60mph and a quarter mile in 11.2 seconds at 126mph. This is a bonifide supercar in every sense of the word while being extremely practical but weighs an owner confirmed 4740lbs. All the while engine roaring, exhaust spitting and popping with in the proper driving mode selected. Hint: That mode is neither “Economy” nor “Snow/ice”. When in Sport, the suspension is sports car firm, doesn’t crash or rattle over bumps and feels as solid as if it had a carbon tub. This one has the Rennsport body lowering kit giving it an even sleeker, aggressive look. Cornering is flat, the weight transparent to the passengers. There is also a selectable real wheel drive only drift mode. But seriously let’s just call it either dyno mode or shred your tires faster mode. This one also has the Performance Exhaust System which is a must-hear and have, especially at cold start-up. Be sure to check out that video as well. Painted in Kona Blue Metallic contributes to a visually lower appearance. 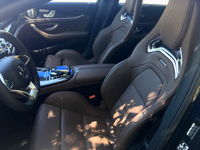 The Nut Brown and Black Nappa leather interior has a warm feel despite the wide digital display screen due to its dash integration versus an upright standalone unit that Mercedes has on other models. 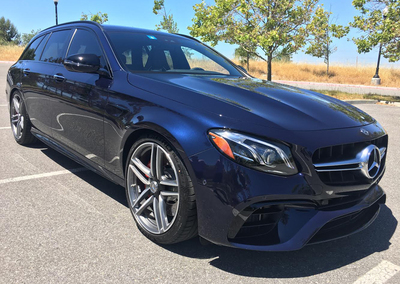 Recent vehicle shopping shows Mercedes offers a large selection of individual options. This one included a black headliner, seemingly rare these days and had an MSRP of 119,000. Some nice touches include a driver’s side control ability for the passenger seat. The owner loves the acceleration which is so accessible with the all-wheel drive, and it has a 21.1 gallon fuel tank. Keep in mind there are serious performance cars with 16 gallon tanks, a significant difference. The only complaint is a desire for a more distinctive fuel gauge despite the large capacity and coolant temperature display for those that like their data. There are amazing performance SUVs and sports cars on the market, but if seeking a driver oriented, sharp handling yet practical hauler where load or child seat access heights and ease of ingress or egress ins’t as critical, this is absolutely the ticket, an "E Ticket" at that.